Christopher Sanders (1905-1991) was born in Wakefield, Yorkshire. He studied at Wakefield School of Art (1922-4), Leeds School of Art (1924-6) and the Royal College of Art (1926-9). He initially earned a living working as a commercial artist designing the logo for Birds Custard and patterns for the upholstery in London Underground trains and as an illustrator working on several of the Janet and John books. He also taught for some years at Harrow School of Art and St Albans School of Art. However it is as a landscape and portrait painter that Sanders is best known. 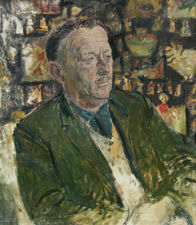 He exhibited frequently and regularly at the Royal Academy from 1933 to 1970. 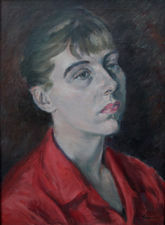 He was elected an Associate member of the Royal Academy in 1953, becoming a full member in 1961. In 1956 he won a gold medal at Paris Salon. He was also a member of the Royal Society of Portrait Painters. He lived near Slough, Buckinghamshire.